Bearings. We love them don’t we? The slide back and forth and make the movement all smooth and perfect. Well, until they don’t and we can’t figure out how we got a dud bearing! I’m hear to set the facts straight on your bearings and how you can keep them moving quieter and smoother right now. This guide will be perfect for those who have just received their kits and have the machine all apart since it involves so little investment in time and energy. For those who have already put your machine together to find out your bearings are noisy and gross I’m sorry and I hope the disassembly isn’t too painful. Let’s get some facts together here. 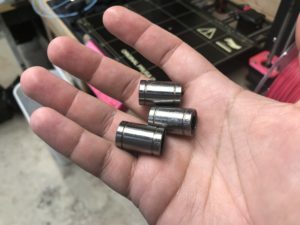 The MK3 runs on 63HRc rods and matching bearing steel LM8UU bearings.They are packed in a light synthetic oil with PTFE in order to prevent corrosion and should give you good movement for a couple months. Your MK2s if it’s over a certain age runs on softer rods and softer LM8UU bearings. Newer shipments are including the upgrade since Prusa has found the new ones to be that much better for a minor increase in price. If you have an older MK2s, 2017 or more, then you’ll likely want to replace your bearings and I’ll have suggestions below. So you know about your bearings but do you know your grease??? In general you shouldn’t mix lubricants. Chemicals used in one could make another become runny or thicken. Basically synthetics tend to play well with synthetics while natural lubricants tend to play well with other natural lubricants. If in doubt always use the exact same lubricant. Simple. Which lubricant is best? 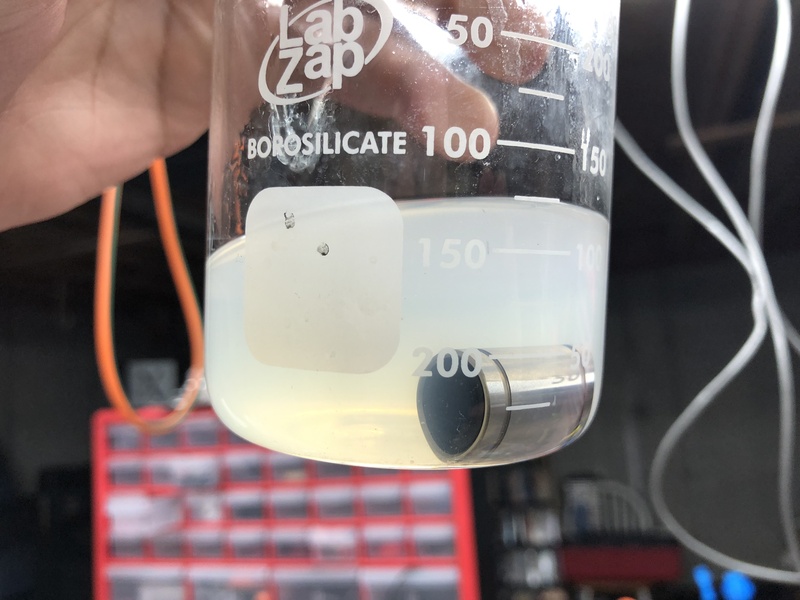 No answer, but we have a top 2 common and easily purchasable lubricants on the market with Super Lube with PTFE as a top choice in synthetic lubrication and White Lithium Soap (Grease) as the top natural lubricant. Yes it’s called Soap because it’s made from fatty acids just like your bar of bath soap. Either of those two will give you long lasting glide with little maintenance issues. Now you hold up and don’t go spreading this stuff around all over your printer. This is a process so stick with me here. You shouldn’t lubricate anything unless you know it has all the old grease or oil removed from it. Why? Head back a bit and remember we shouldn’t be mixing greases or oils. We need to degrease these bearings if you want to do this correctly. Snag yourself a bottle of 99% Isopropyl Alcohol and pour it into a class container. I like glass since it won’t react and you can see the magic happen. I tend to have a collection of beakers around since you know, mad scientist stuff, but any clear glass or plastic container will work. Put your bearings into the container and fill a healthy amount past the bearings with the Isopropyl Alcohol and give it a swash or ten then put it down while we prep some things. We are using Isopropyl alcohol because it’s a lot safer than standard degreaser and you most likely already have some for cleaning your print surface so hurray for purchasing things we need and nothing more. Please note that you shouldn’t need to leave them in there for more than 20-40 minutes with occasional swashing around. Don’t shake them and don’t scrub them. Also if you take them out you must immediately lubricate them to prevent rust. If you have to leave for any reason pat dry the bearings and place them in a bag with a little of the grease you purchased and coat them till you get back. WARNING. Acetone is BAD. It will melt the protective plastic seal and your bearings will be ruined. NO acetone. While you’re waiting for your bearings to degrease you need a way to pack the bearings with your new grease and thankfully Thingiverse is here to see the day with this Linear Bearing Greasing cap for the Super Lube bottle. You should print this in PLA or PETG if you have it and perhaps a couple in case you need them in the future. While it’s printing you go swash those bearings around and get them prepped by drying them on some paper towels making sure they aren’t storing any alcohol around. Let them sit on some paper towels for a few minutes so they completely dry and get ready to pack these bad boys. Attach your new cap to your grease bottle. Insert the cap into the bearing lining up the slots to the bearing rows and squeeze. You should keep squeezing until a little grease comes out the other end of the bearing. Repeat this for every single bearing and place them in a ziplock bag. Don’t worry about removing any extra grease yet as you want them a little coated to prevent rust. Time to reassemble your printer and with that you have to do one more magical thing with your bearings. Grab yourself a few more paper towels and run each bearing down each and every rod that comes in the kit. This is remove excess grease and also partially grease the rods which is good practice. The bearings may feel like they aren’t super smooth now, but that’s fine. It’ll break in quickly and once it has the weight of the X gantry or the Y axis they will be much smoother. I know this is messy but in the end it’ll be worth it. If you don’t like getting messy I recommend nitrile gloves since they are less reactive to chemicals than latex without the possible allergic reaction. After assembly you may notice that the axes move smoothly but they don’t slide from one end to another all slidey like. Good. One of the many misconceptions about bearings is they need to have zero friction. This is why people like Igus bearings. The problem is when you have no friction you also don’t have smooth acceleration or deceleration. Basically the less friction the greater the backlash. 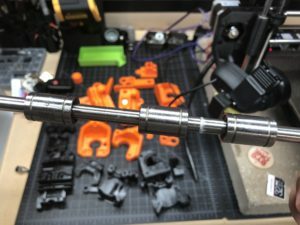 So yes, Igus bearings hurt your print quality. I said it and I’ll say it every time. If you like sloppy bearings and lots of additional ringing in your prints or lots of overshoot then feel free to pick up a set of Igus bearing for your 3D printer. I warned you though. 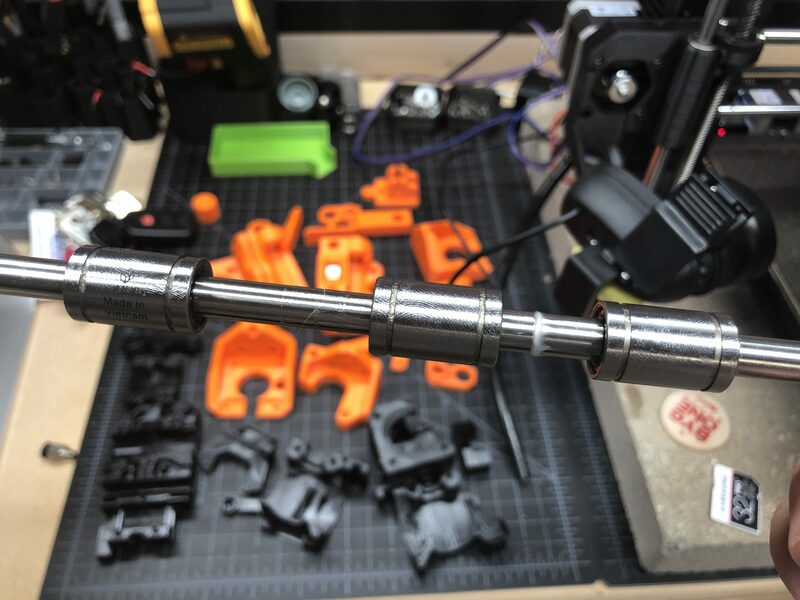 Now once you’re completely assembled you’ll notice a much quieter movement, a much smoother movement, and a movement while printing that has less overshoot since we actually have proper friction in our system. I recommend a teardown 6 months from now to repeat these steps and place any upgraded parts on your printer. A well oiled machine is a happy machine. 12x LMU8 bearings in the Misumi shopping list? Sorry it took forever for the site to update. It is 10 total bearings. Loving these blog posts! Thank you for all the help! Great guide and really helpful, thanks Chris. 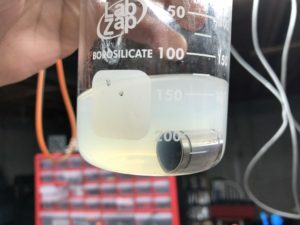 I find the best lube for printers is “Liquid Bearings” which is a synthetic that works much better than superlube or white lithium (ugh, too thick and gunky). A small bottle lasts almost forever, and is compatible with a wide range of other lubricants that may have been left behind. It thins old crusted lubricants, and resists gumming much longer than superlube which was my previous go-to. I will snag some and try it out. Thank you! Do you recommend a specific y rod holder or are the Prusa holders with zip ties the best to use? Its interesting that Prusa doesn’t grease up the bearings before they ship them since it sounds like it is a cheap way to improve the system. I wonder what they’ve done in their own printer farm. Waiting for a batch of superlube to arrive before I continue with my MK3 upgrade. This may be a dumb question but to maintain the rods after this, how do you recommend cleaning dust off of them. I had previously been cleaning them using 3-In-1 every so often to keep everything clean. Wanted to thank you for writing this. I gave my prusa a bit of TLC and now it is quieter than the first day I put it together. The link for the lube doesn’t work? There are several super lines with PTFE, which one do I use? I bought Misumi rods and bearings. Do I need to do this to brand new Misumi bearings that already come in a Ziploc bag heavily coated in oil? Why PSFJ rods and not PSSFJ? Thank you Chris. Use this every 1-2,000 hrs on the Mk3 and today during assembly of Mk3 #2. Always great info. Wow, I wish this would have been in the original assembly guide. Did I miss it? It’s entirely possible. But cool! I checked with Misumi, and with the 6-bearing and 4-rod option it was around USD105 with tax and shipping. I passed. That’s too much for me. But I did order the lubes.